So I am late with this review. The Martian written by Andy Weir is a fantastic hard Sci-Fi novel an out a mission to Mars which goes awry, particularly for the astronaut left behind. The book is well researched and well written. I particularly enjoyed the explanations of difficult science concepts, which were put in simple terms by the character Mark Watney. Although it took awhile for me to read (simply because of my busy schedule) this book as great! If you haven’t already picked it up, I highly recommend that you do! I give this book 4.5 nerdy glasses out of 5! As always, check me out on Facebook and Twitter. Hope to see more of you in the new year! Geek and Sundry and Critical Role! 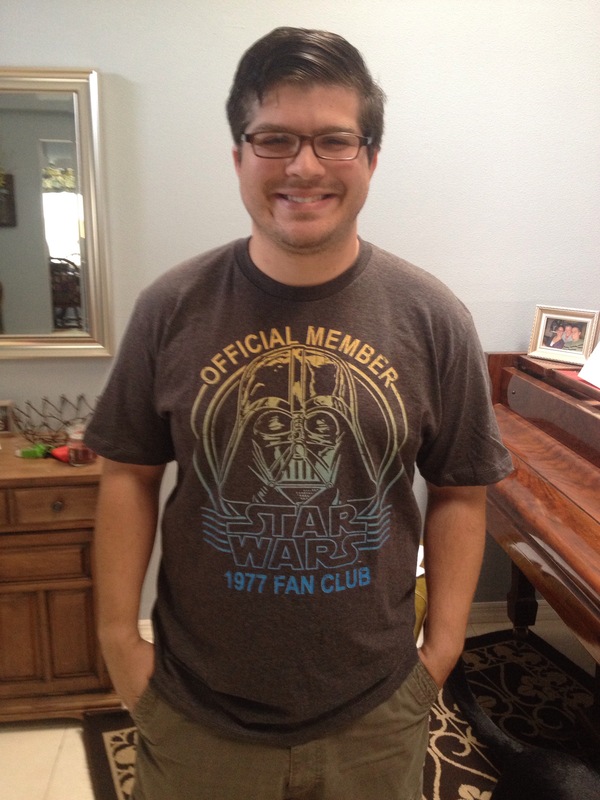 If you didn’t already know…Geek and Sundry is awesome. Like this post if you agree…and if you don’t then I’m going to assume that you don’t know what I am talking about. Geek and Sundry is run by overlord Felicia Day, actress and geek culture extraordinaire. They write articles and produce webshows which first aid in the site, then later are made available on YouTube. Some of their programming highlights include Co-Optitude, where Felicia plays video games with her brother, TableTop where Wil Wheaton plays board games with several other celebrities, Spellslingers where day9 plays Magic the Gathering with celebrity guests, and finally Critical Role where 9 voice actors play Dungeons and Dragons. This has to be one of the best things that I have discovered about nerd culture. Whether you know everything or nothing about DnD you owe it to yourself to at least watch an episode. To see the ease with which these actors slip into and out of character is astounding. Currently I am a bit behind the live shows…especially since I just recently discovered this show yet I find myself feverishly trying to catch up so that I can watch on Live on the Geek and Sundry Twitch channel. They really are great ambassadors for geek culture. The website fundraisers for different causes and through donations during play Critical Role raises money for 826 LA, which is a nonprofit which provides after school tutoring for students. As I said, you owe it to yourself to at least check out an episode. Critical Role airs live on the Geek and Sundry Twitch channel Thursday nights at 7pm Pacific Time or you can catch old episodes on the Geek and Sundry YouTube channel. There is literally a little something for everyone on the website. Please visit their website and puts around by clicking here. Where do you get your geeky fix on the Internet? Let me know in the comments section below and I’ll let you know what I think. Also please Like me on Facebook and Follow me on Twitter. So there are many companies that come to mind when I think of Tech companies. Google, Facebook, Apple, and Microsoft to name a few. What I don’t typically think of is Disney. Since becoming an Annual Pass Holder, I have been able to witness more Disney tech recently than I have in the past. For a look at some of the tech being used outside the parks, see my article here. Let me start by saying that the MagicBands are absolutely genius! They function wonderfully. Image credit goes to Disney. No challenge of ownership is implied. These bands house RFID tech and function as your keys to the park. They act as your ticket, by scanning at the gate, and a using a fingerprint to authenticate your identify. This is really cool, especially when used by gate staff to add to the magical experience of visiting Disney. As Claire scanned her band, a staff member looked at their reader, took note of her name and said “Welcome Claire!” as we entered. That alone could have made Claire’s day! They also function as your FastPass allowing you to cut the line for certain rides provided you signed up to receive a FastPass from that ride. It used to be that a FastPass was an extra slip of paper that you would have to keep track of and sometimes would lose. 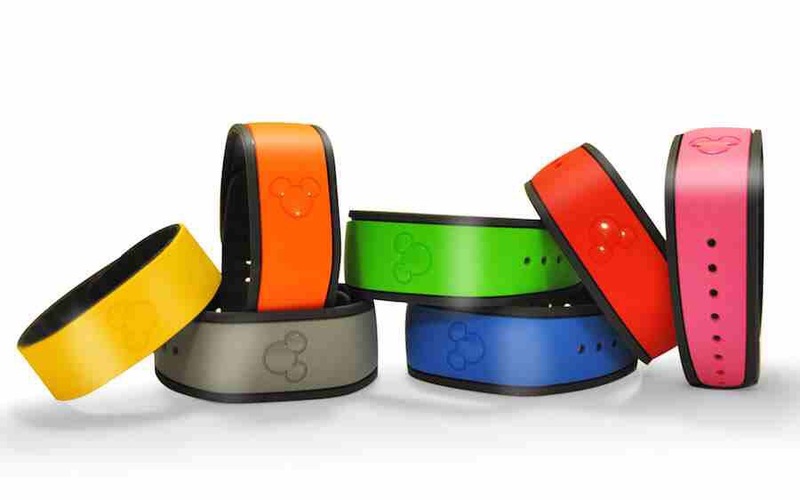 If paired with a credit card, the band can also be used for paying in the parks. This uses much of the same technology that Apple Pay uses. I think one of the coolest applications for the Bands is using them for a photo pass. Throughout the park are photographers taking pictures of guests. If I equipped they will scan a card with a QR code. When ready the pictures can be previewed and purchased at a store or can be viewed through the Disney Park app. As previously stated, I lose things, and this card is just something else to lose track of in the park. The band can be scanned and used as the photo pass. Brilliant. That last application is that if styling on property the band can be used as a room key for your hotel room. I love Disney’s commitment to making a wearable device with so many applications! Please let me know what you think of the MagicBands! Leave a comment below, and check me out on Twitter, Facebook, Periscope @dadthegeekblog and YouTube at DadtheGeek. So a few weeks ago I was contacted by a company to do a review. That company was Fifth Sun which is an apparel company that has a large amount of licenses. Let me start out by saying that first, this is the first time that I have reviewed a company that has asked for a review. Second, please read this completely through so that you read the entire story. So after I was approached and told to pick a shirt, I set off to attempt to do exactly that. Let me tell you, Fifth Sun has a bunch of licenses, so you will have no problem finding a brand that your Geek Dad is a fan of. The problem comes with the next step, finding a design that you like. I narrowed my search to the Star Wars selection…and found that they literally have over 1,000 shirts which have a Star Wars design. I quickly got on the phone to call customer service. 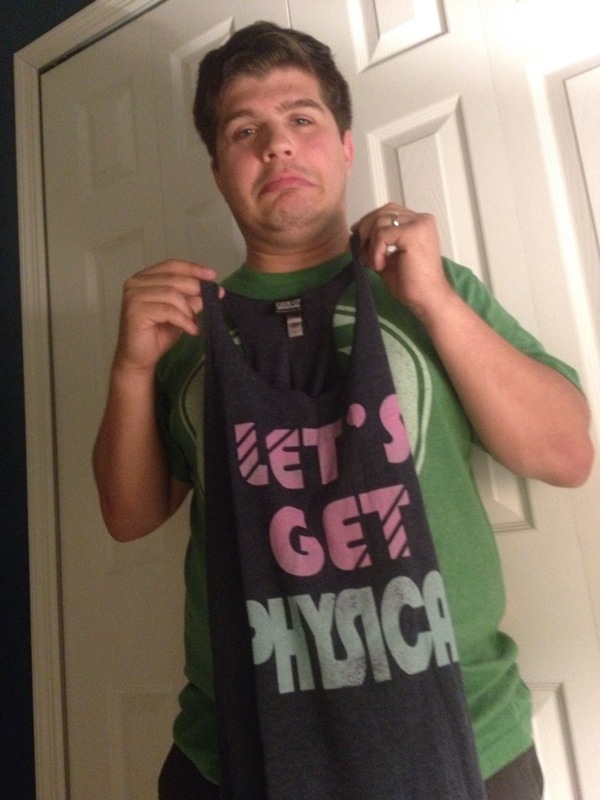 They quickly remedied the situation, by ordering the correct shirt and even allowed me to keep the tank top to pass off to someone else. After the reorder I got the correct shirt, and I have to say that it is fantastic. It is very comfortable, and I love the graphic. I would definitely order from them again. So to conclude, a crazy large selection, super helpful customer service, and a comfortable product. I give Fifth Sun four and a half geeky glasses out of five. (The only reason for the half off is because of the initial slip up in the order). Please send them your business this Father’s Day and let them know you heard about them from Dad the Geek. Also be sure to stay tuned to the Facebook and Twitter feeds. This post is going to be mainly geared toward the men out there. Ladies if you read this further, this is going to be a killer gift idea for any man in your life (unless he has a ridiculously awesome beard). Men I have found a line of products that makes every shave the BEST SHAVE OF YOUR LIFE! That’s right I have found the Holy Grail of shaving products and it all started in the geekiest way possible, with a trip to Comic Con. 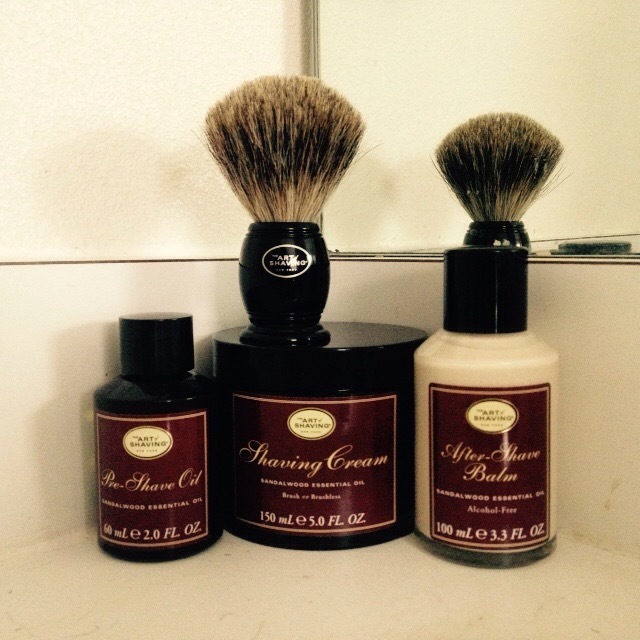 The product line is put out by a company called “The Art of Shaving.” Check out their website hereWhat they sell are shaving kits that include a preshave oil, shaving cream, a shaving brush made from pure badger hair, and an after-shave balm. They sell other items such as handles which fit standard razors from companies like Gillette or Schick, fancier brushes, and straight razors, but I would like to focus more on the kits. As you can see from their website there are four main scents associated with the kits. There are unscented, sandalwood, lemon, and lavender. The starter kit has a small amount of each product, and is only $25. It also comes with a $25 coupon off of the full size kits. Once you have picked a scent we are off to how to use the kits. Kits come in a varying degree of sizes, but all work the same way. First as always you will want to have hot water on your face. This will cause your facial hair to stand up so that you will get a closer shave. You will also want to fill the sink with hot water. Next is the pre-shave oil. This is going to coat your face. Next it is time for the shaving cream. This step might also be foreign to some guys, especially those using cream from a can. You want to use just a small bit on the wet brush and brush it on your face. Now shave normally, but rinse your blade in the sink which is filled with hot water. Once finished rinse with COLD water, dry and apply a small amount of the after-shave balm. If you have done all of that you should have just experienced one of the best shaves of your life. I am told it is only second to a barbershop style shave. I have not had one but will UPDATE once I have. Have you had a barbershop shave? Let me know in the comments below. Also be sure to check me out on Twitter and Facebook. This Christmas We Were INVADED!! This Christmas my house was invaded…not by killer zombies, or aliens, hostile army’s or in-laws (whom I love!). We have been invaded by none other than a classic sci-fi antagonist…ROBOTS. Not just any robots, but a robot so keen on helping humankind, that it has taken upon itself the monumental task of vacuuming my household. This is no easy feat. As you may have read on my About Page I have 2 dogs. As you might have guessed from this opening, my family received a Roomba for Christmas. It is very cool and I must say entertaining. We ran it for the first time on Boxing Day (for those Americas who don’t know that is Dec. 26th. (Which I didn’t know until I started dating my wife)). One of my quirks is that I will often make jokes to my wife by narrating an event, or taking on the voice of something else. This device proved to be one of the funniest things to narrate in quite some time. It is constantly trying to map out the area so it is constantly running into things. It also has a way of depositing some objects which it cannot pick up which is also humorous. As for performance, the little thing seems to be doing a very good job! As I mentioned I have two dogs…who shed. A LOT!! I am talking when we sweep or vacuum there is enough hair on the floor to create another dog…and I am not talking about a small dog either, I am talking a 50-70 lb extra dog. From what I can tell this thing only missed two balls of fur on its first pass. And by the contents of the bin I am thoroughly impressed with what it can do. My wife insisted that we name it. 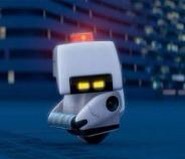 So thinking on my feet I suggested the name “Moe” after the cleaning robot on Wall-E. This robot is called M-O short for Microbial Oblitorator. I figured it would be an appropriate name for any cleaning robot. I am sure I will be posting about it more later. I hope you had a wonderful Christmas/Holiday Season. What’s was your favorite geeky gift that you either gave or received? Leave a comment below! Also be sure to LIKE me on Facebook and FOLLOW me on Twitter. And for anyone who didn’t see this…MERRY CHRISTMAS!